Gerhard Hein: pastor and editor; born 30 November 1905 in Golyschevo, Ufa, Russia to Dietrich Jacob Hein (11 February 1869, Neuhoffnung, Alt Samara, Russia - 15 April 1920, Davlekanovo, Ufa, Bashkortostan, Russia) and Katharina (Harder) Hein (24 February 1867, Muravyevka, Alt Samara, Russia - 29 October 1939, Nikolayevka, Ignatyevo, South Russia). He was the 8th child in a family of 3 sons and 8 daughters. In 1936 Gerhard Hein married Lydia Hege (29 August 1908, Oberbiegelhof, Hasselbach, Germany - 13 January 1997, Deutschhof, Rheinland-Pfalz, Germany), daughter of Philipp Hege (1877-1941) and Elisa (Funck) Hege (1881-1943), in Ibersheim, Germany. They had two sons, Eckart and Wilfried. Gerhard Hein died 7 October 1990 in Bad Bergzabern, Germany. After graduating from high school in Dawlekanowo, Russia in 1924 and being baptized a year later at the Ufa Mennonite Brethren Church, Gerhard Hein emigrated from the Soviet Union to Germany in 1925. Unlike many Mennonite emigrants from the Soviet Union, Gerhard remained in Germany, where he studied theology (1925-1931). After spending a year at a Bible school in Wernigerode, he studied at universities in Goettingen, Tuebingen, Muenster and Leipzig. Among his appreciated professors were Adolf Schlatter, Karl Heim, and Karl Barth. Following his graduation, Hein worked as an intern (1931-1935) under the well-known pastor, historian, and editor, Christian Neff. It was during this time that Hein began writing articles for the Mennonitisches Lexikon. During his semester vacations, Gerhard visited many Mennonite families in southwest Germany. On one of these visits at the Mueckenhaeuserhof, near Worms, he met his future wife, Lydia Hege. Lydia supported and assisted Gerhard in many congregational visits, and was actively involved in women’s ministries, serving several times as speaker at women’s conferences. During their time in Berlin, she also served as manager of the Menno Home. Gerhard was ordained as a pastor for the Mennonite communities of Sembach, Berlin, and Monsheim in Germany. His ministry in Sembach, in the Palatinate, started in December 1935. It included serving the neighboring communities of Altleiningen and Neudorferhof and later also Enkenbach (1935-1940 and 1945–1958). During World War II Hein served as a secretary in France and as an interpreter in Russia (1940–1945). After the war, Hein devoted much time and energy to youth ministry, organizing many well-attended youth retreats. He also initiated the conversion of an old barn adjacent to the pastor’s residence into a multi-purpose meeting center that was used for many functions, including those arising from the influx of refugees coming from East and West Prussia. His ministerial responsibilities increased with the newly acquired care home for refugees in Enkenbach. Hein was editor of the Mennonitische Jugendwarte (1932–1938), the Junge Gemeinde (1948–1956), and Der Mennonit (co-editor from 1952-1954 and editor from 1954–1965). When Hein was asked to complete the fourth volume of the Mennonitisches Lexikon, he moved to Berlin to take on a three-fold ministry: serving as pastor to the Mennonite Berlin congregation (1958-1965), editing the monthly journal Der Mennonit, and editing the Mennonitisches Lexikon. Hein concluded his pastoral ministries in Monsheim / Obersuelzen (1965-1973). During this period, he was able to complete his work on the Mennonitisches Lexikon, just in time to be introduced at the 8th Mennonite World Conference in Amsterdam in 1967. Hein also served as editor of the Mennonitischer Gemeindekalendar (1968-1970). Gerhard Hein wrote more than 250 articles and contributed to about 175 editorials, many of them dealing with Anabaptist and Mennonite history in southwest Germany. 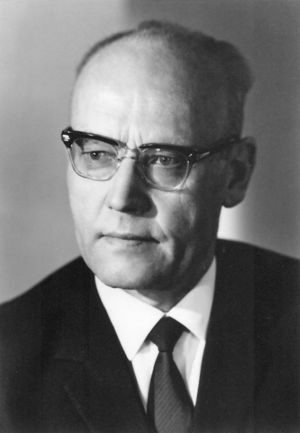 Gerhard held the following positions: Vice-Chairman (1963-1968) and Chairman of the Mennonitischer Geschichtsverein (Mennonite Historical Society) (1968-1975), Chairman of the Deutsches Mennonitisches Missionskomitee (German Mennonite Missions Committee; DMMK), and Chairman of the Rhineland-Palatinate and Hessen Mennonite congregations (1968–1972). Gerhard Hein’s ministry was focused on spiritual edification and creating an awareness among Mennonites of their rich Anabaptist history. GRANDMA (The Genealogical Registry and Database of Mennonite Ancestry) Database, 16-01 ed. Fresno, CA: " California Mennonite Historical Society, 2016: #1027548. Hein, Gerhard. Ein Russland-Deutscher Erlebt Ost und West (Experiences of a Russian-German in the East and the West). Unpublished manuscript. Hein, Gerhard, ed. Ufa, Die mennonitische Ansiedlung bei Ufa am Uralgebirge 1894-1938. 1975. Hein, Gerhard. Vertrauen, Freuen, Danken. Weisenheim am Berg, Germany: Agape Verlag, 1992. Hein, Wilfried, trans. A Witness in Times of War and Peace: The Story of Gerhard Hein, a Mennonite Pastor who served in the Wehrmacht During World War II. Victoria, BC: www.friesenpress.com, 2015. This article is based on the original English essay that was written for the Mennonitisches Lexikon (MennLex) and has been made available to GAMEO with permission. The German version of this article is available at http://www.mennlex.de/doku.php?id=art:hein_gerhard. Hein, Wilfried. "Hein, Gerhard (1905–1990)." Global Anabaptist Mennonite Encyclopedia Online. May 2016. Web. 19 Apr 2019. http://gameo.org/index.php?title=Hein,_Gerhard_(1905%E2%80%931990)&oldid=135157. Hein, Wilfried. (May 2016). Hein, Gerhard (1905–1990). Global Anabaptist Mennonite Encyclopedia Online. Retrieved 19 April 2019, from http://gameo.org/index.php?title=Hein,_Gerhard_(1905%E2%80%931990)&oldid=135157. This page was last modified on 20 July 2016, at 14:45.